The other day I overheard a health food devotee reprimanding someone for enjoying a beverage. That alone was sufficient to irritate the hell out of me, but our conscientious volunteer food mentor managed to strike an additional chord in my legion of pet peeves by whipping out one of the most arbitrary health food buzz phrases in the book: All Natural. Now, if you want to help me to eat better, I appreciate that, but I am a practical guy, so I’m going to require something a bit more concrete than meaningless blurbs on food labels to convince me to ditch the aspartame. The beverage in question in this case was coffee, which already tells you that our dietary tutor has very weak self preservation skills. I’m pretty sure it isn’t even against the law to murder a person for interrupting your first cup of coffee. Here in New Jersey, we call that “Natural Selection.” None the less, at the risk of justifiable homicide, our helpful individual pointed out that the sweetener added to the coffee contained (gasp!) high fructose corn syrup! This insidious processed foodstuff was evidently lurking in his donut as well! Now, how the nutritional guru came to possess such an encyclopedic knowledge of junk food composition is anybody’s guess, but more troubling was her insistence that in the future he partake of an all natural sweetener, like honey. There are plenty of foods that I’ll buy the whole “All Natural, Unprocessed” sales pitch for, but honey is definitely not one of them. Honey does not occur naturally, I don’t care what you say. There is no honey mine, there is no honey tree. Honey is manufactured, the result of a bee’s digestive system. We are talking about creatures that consume a plant product, and then mix it with enzymes and chemicals in order to manipulate its nutritional value and extend its shelf life. … HOW IS THAT NOT PROCESSED!? They even build a structure to do it in, complete with little geometric shelves. And by the way, you know what tends to be the primary ingredient of honey? FRUCTOSE! So if the bees in question got their nectar from a corn field, honey IS high fructose corn syrup! Explain to me the difference between that stuff in my fruit punch and that stuff in your green tea. Is your sweetener somehow superior because it has been vomited up by an insect? I know what you’re thinking. Honey counts as “All Natural” because it was created by bees, and bees are creatures of nature. Well, sure, but so are humans! Where do you draw the line? Is it thumbs? If a monkey made a muffin, would that muffin be natural or processed? Saying that something is natural as long as it was made by a non-human means that if we can train dogs to run the production line at the Coca-Cola bottling plant, then they can write “All Natural” on the bottles of Diet Coke. If Hostess hired a bunch of trained parakeets, could they call their Twinkies “All Natural”? And who says that “All Natural” is such a good thing? Cashews, if eaten without at least SOME processing, are toxic! The shell is pretty much like poison ivy. Sure, you could take it off, but then you’re fooling around with all of that natural perfection. Far better to eat it as nature intended. That itchy burning you feel in your throat is just Mother Nature showing she cares. Go ahead and wash it down with an arsenic and mercury smoothie. There are plenty of reasons to shoot for foods that are less fooled around with, and I fully respect your preferences. If you want organic long grain brown rice with your meal instead of good ol’ bleached to perfection white rice, by all means, eat what you want. Just be aware that, generally speaking, the difference between what you are eating and what I am eating is philosophical at best. When you get right down to it, the line between natural and artificial is a blurry one, and worse yet, it is a line drawn by (double gasp) human beings. 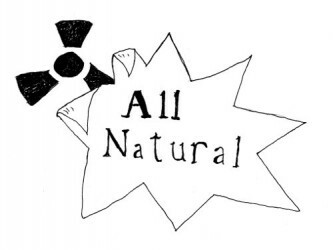 That means that the very concept of All Natural is itself artificial. So take a deep breath, enjoy your beverage of choice, and let other people do the same. And let me assure you, if you keep bugging people when they are partaking of their morning caffeine, you’ll find out pretty quickly that if they started doing what came naturally at that moment, it wouldn’t be very healthy for YOU at all.